I started thinking about what I wanted to do for Pregnancy and Infant Loss Awareness month. I still haven’t entirely figured it out yet because though I plan to do some of the things on this list, I want to do some other things too (ever the overachiever…). Regardless of that, I wanted to let you all know a few things you could do to support yourselves, your friends, your partners, etc. in dealing with PAIL during this month. Check out my list below and feel free to comment with some other things if you’d like. Sending love & healing to all my fellow angel mama’s out here. There are tons of these walks happening around the country so try doing a Bing or Google search to find out what may be happening in your area. You don’t have to talk to anyone if you don’t want to. Sometimes just being in a space with other folx who have experienced this type of loss can feel so cathartic. There’s something very powerful about being in the company of those who know your specific type of pain. Take the walk alone, or take someone (or a few people) with you. Make it an experience to honor the child(ren) you wanted so badly but couldn’t keep. This is something I do every week as part of the ritual for our girls. If this is not already part of your practice (and even if it is), this is a great time to incorporate it. I light tealight candles for this because they burn for a while and go out on their own. It’s like you give them life by lighting them, they stay for a while and illuminate your room, your heart, your spirit with beauty and warmth, and when it’s time, their little flame fades. I like to think of it as creating a way for our little ones to find us in the dark. This occurs every year and is related to #2. It occurs at 7pm your standard time and you leave the candle lit for at least an hour. It results in one continuous wave of light across the globe for 24 hours. The PAIL campaign began on 10.15.02 and this wave of light is just one of many ways to keep this remembrance going. Say your little ones’ names, talk to them, send love into the universe for them and for all the other little babies being grieved along with your own. It’s really a beautiful gesture. If you haven’t lost a child but are close to someone who has, light a candle at 7 pm on 10/15 for the little one(s) you didn’t get to meet either. Love doesn’t die and I firmly believe their spirits can feel/sense the love being projected out for them. The thing is, it feels like people forget about your loss after a while. I don’t think it just feels like it, I think that actually happens. People assume you’ve moved on, they don’t want to keep talking about it or frankly, they’ve moved on & have their own life events happening so they forget. The hard part is that we don’t forget. 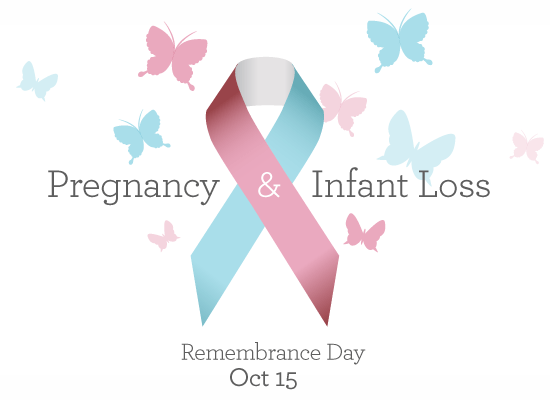 We carry our loss and live with the absence of our little ones every minute of every day. So guess what? It’s really nice when someone calls and just asks how you are. When someone realizes you may be going through it and could benefit from a kind word or check in. One of my friends who is the self-proclaimed godparent (she was going to be asked anyway though) to our daughters gave us a beautiful box the other weekend. She wasn’t sure what or how we could use it but she saw it and thought of us. I have it with the rest of our girls’ things and it now is the home of the ashes that could not fit in the small urn we have. It’s a beautiful addition and it really just reminded me that my friend still thinks of us and Jora & Aviva. It makes me teary eyed just thinking about it… the kindness that is continually shown. Be that person for your friend/loved one. Say the child’s name, give then a small token that shows you’re thinking of them and the baby. It means more than you know. Perinatal loss is often not discussed. It’s taboo and sad and scary and all of these other unpleasant things so people tend to be tight-lipped about it more often than not. I mentioned this before but after I opened up about losing my girls, so many people messaged me about their losses. Some early, some later on in pregnancy, some stillborn at full term. It was heartbreaking to hear all these stories but it also let me know that I wasn’t alone. As i mentioned above, the shared pain is oddly comforting. There’s a few small things you can do but this is a cute way to support and show solidarity. There are a lot of filter options ranging from the super simple pink & blue overlay to more elaborate banners and such to use over your profile photo. You can also wear a pin for PAIL (usually a pink and blue ribbon or footprints), paint your nails in honor of PAIL or simply just acknowledge that this is an issue many people have experienced for a variety of reasons. None of which makes coping with our losses any easier to be honest. So show support… it’s a small thing you can do that will mean SO much. I love this post. For me it means a lot since I lost my first born Kailyn Ashleigh Collins 11/21/2004. We burn a candle for her on that day. Will definitely be lighting a candle today as well! Thank you! I love that you have a ritual for little Kailyn and I’m so sorry to hear that you lost a child too. It’s incredibly heartbreaking and unfortunate. Sending love to you and your family.